Collects and disseminates information on offender employment programs. Provides training for staff who provide employment services to offenders and ex-offenders. Provides assistance to state and local agencies for improving job training, placement, and retention services for offenders. Develops partnerships with federal, state, and local agencies to provide offender workforce development training in their home jurisdictions. As described by the American Probation and Parole Association (APPA), "...this presentation will provide the 'real talk' necessary to think critically about the truths, lies, twists, and real-world trials about criminology, implementation science, and organizational change. Blunt, honest, sometimes funny, and painful where necessary, the presenter will illuminate the realities of modern sciences as they apply (or not) to real-world and authentic, lasting change. Attendees will learn to think beyond the conventional norms about how to effect real organizational change. Attendees will also be given basic introduction to the 10 Essential Principles for Implementation Leadership - practically derived and scientifically supported approaches to leading real-world change in criminal justice settings." National HIRE Network (New York, NY). This page includes state-specific governmental agencies and community-based organizations to assist people with criminal records, practitioners, researchers, and policy makers. These agencies and organizations may be of assistance in providing job-related and legal services, answering questions arising from having a criminal record, or offering referrals to other useful organizations. Looking for a One-Stop Center in your jurisdiction? Take a look at Job Banks for your state. 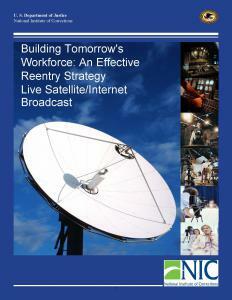 This easty to navigate site provides resources on a range of reentry issues. The website also contains the Report of the Re-Entry Policy Council, a comprehensive guide published in 2005 that contains hundreds of policy recommendations for legislators, service providers, researchers, criminal justice professionals, and others involved in creating and implementing effective reentry initiatives. 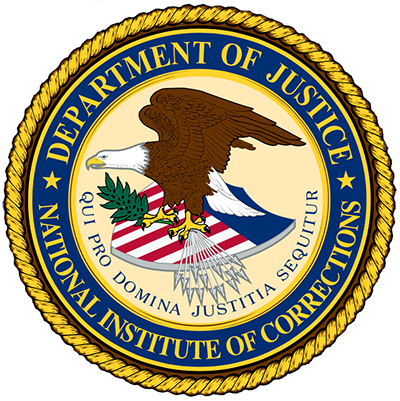 U.S. Federal Bureau of Prisons (Washington, DC). "A handbook containing useful checklists, available services, helpful tools, and many other reentry resources." This is a resource manual developed by FCI McKean for their Offender Transition Program. The manual contains information on internet resources, career exploration, and general assitance programs. "Employers face global competition in their drive to operate successful businesses in today’s marketplace. If the correctional system is to be successful in placing job seekers in meaningful employment that meets employers’ expectations, correctional practitioners must prepare them for the workplace well in advance of their release. Practitioner knowledge of employers’ staffing requirements contributes to the success of this mission. New tools and proven strategies can greatly assist justice-involved individuals transitioning to the community workplace. necessary for post-release success" (p. 1). This publication will explain how to use these tools. Sections cover: the types of assessment that are most effective at ensuring a good job match and successful placement; what job readiness is; barriers job seekers encounter and the resources that can help address these challenges, such as the National Institute of Corrections (NIC) "Thinking for a Change" cognitive-based program for offenders transitions back into the community; what can be done during the time of incarceration to teach job retention skills; what training is available for staff interested in building effective pre-release job training programs; effective practices; tips; and resources. "Below you’ll find  answers to questions you may have about how being incarcerated in an adult correctional facility or committed to a juvenile justice facility affects your eligibility for federal student aid for college or career school" (p. 1). This series of issue briefs from the Evaluation of the Linking to Employment Prerelease (LEAP) grants explores key challenges in establishing American Job Centers [AJCs] in local jails. Princeton, NJ, and Oakland, CA: Mathematica Policy Research and Social Policy Research Associates. This brief "explores their approach to staffing jail-based AJCs, including the varying staffing configurations, key staff qualifications, hiring and onboarding processes, and strategies to expedite hiring based on lessons learned". "Linking to Employment Activities Pre-Release (LEAP) grantees were permitted to spend the first 9 months of the 24-month project period on planning and start-up activities before enrolling participants into their jail-based American Job Centers (AJCs). This brief uses data ... to explore the factors that enabled them to complete these activities more quickly than the time allotted." This brief discusses how LEAP workforce development staff worked with jail administrators to gain access to jail space and their strategies for scheduling services inside the jail-based AJC[American Jail Center]. "This brief uses data from site visits to 8 of the 20 Linking to Employment Activities Pre-release (LEAP) sites to explore the role of Internet access in pre-release employment services as well as the resources, staffing, and infrastructure needed to establish Internet access for a jail-based AJC [American Job Center]." This brief draws on data from visits to all 20 LEAP sites and focuses on the strategies the grantees used during the early planning and implementation period to build common ground between jail and workforce staff in promoting successful reentry for participants. Doug Burris, Chief U.S. 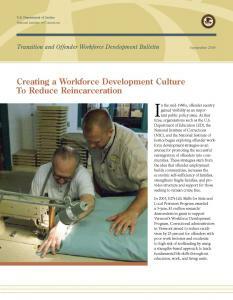 Probation Officer for the Eastern District of Missouri, talks about his district's involvement in the Offender Workforce Development Specialist (OWDS) training program and the impact it has made on employment rates and revocation rates.